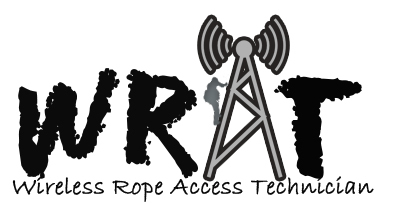 Tower Safety and Instruction is the first to introduce the WRAT (Wireless Rope Access for Telecom). We have combined the expertise and experience of our Wireless and Sprat Level 3 Instructors to create an experience with the learning skills of two industries into one. The expertise of our trainers offer and adapting them to the wireless worker, is a needed change for Telecom Training or WRAT. The wireless industry skills and knowledge of transcending across antennas, cables, RRH’s, and unfortunately mounts that do not allow enough working room and many more obstacles. We built our training curriculum knowing what our students are facing. This is why we formed WRAT ( Wireless Rope Access Technician), it effectively teaches the tower worker with simple, quick rescue techniques, knots required for our industry, fall protection standards and Cognitive learning. 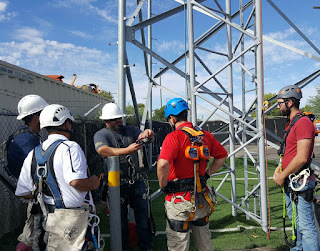 Tower Safety works closely with industry leaders such as of AHS Rescue http://www.ahsrescue.com/, they train and assist with Rope Access, Search & Rescue, Industrial, Power Utility, Water and Fire Rescue. Our ability to work closely with Dale Stewart, the owner and trainer of AHS Rescue, gives us the opportunity to learn about new equipment the different industries are using and how we can apply them to our wireless environment. At Tower Safety there is an overall appreciation for all businesses and employees that work at heights. Our WRAT program combines our team of trainers with over 20+ plus years in telecom, from pole climbing to underground cable repair to wireless and 20+ years in rope access, rescue and a former behavioral psychologist for the US ARMY. The extensive knowledge and background of each member brings is unsurmountable to the tower worker. We, at Tower Safety, know it takes a team to make the Best of the industry, Better!